Retired October 31, 1946. Died January 1, 1984. 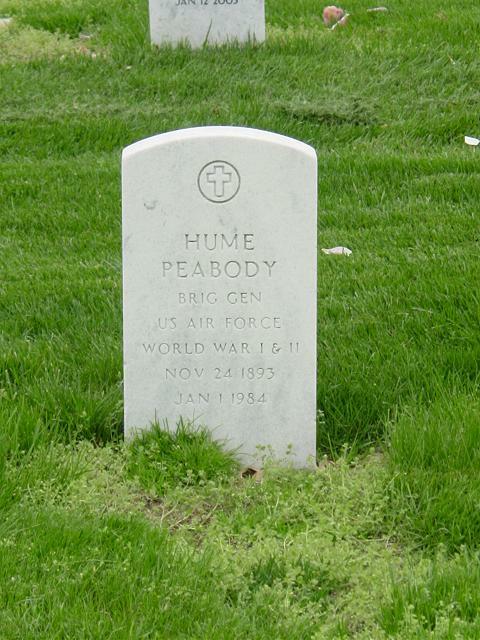 Hume Peabody was born in Shinglehouse, Pennsylvania, in 1893. Following graduation from the U.S. Military Academy, West Point, New York, he was appointed a Second Lieutenant of Cavalry on June 12, 1915. He first was assigned to the 3rd Cavalry at Brownsville, Texas, on border patrol duty. He had a skirmish with bandits at Tahuachal, and at Villa Verd Ranges, Mexico, in June 1916. He was stationed at Brownsville until March 1917, then moved to Fort Sam Houston, Texas, where he remained until 1917. He was detailed in the Flying School, San Diego, California, thereafter until December 1917, and following graduation remained on duty at that station until February 1918. He then moved to Ellington Field, Texas, until March 1918, and to Eberts Field, Ark., until the following May. He was at the Massachusetts Institute of Technology, Boston, Massachusetts, until September 1918, when he was assigned to Washington, D.C., with the Training Section of the Air Service for one month. He sailed for France for duty with the American Expeditionary Forces in October 1918. Returning to the United 5tatos in December 1918, he was assigned to March Field, California, until June 1922. For the next five months he served at Luke Field, Hawaii, then returned to the United States for duty at Crissy Field, California, until May 1923. For the next five years he was assigned as Professor of Mi1itary Science and Tactics at the University of California, Berkeley, Calif. He then enrolled in the Air Corps Tactical School, Langley Field, Virginia, from which he graduated in June 1929. He enrolled in the Command and General Staff School, Fort Leavenworth, Kansas, and graduated from the two-year course In June 1931. He then was assigned as assistant commandant of the Air Corps Tactical School, Maxwell Field, Alabama, and remained in this capacity until July 1934, when he enrolled at the Army War College, Washington D.C. Following graduation in June 1935 he was assigned to the 13th Composite Wing Fort Shafter, Hawaii. He returned to the United States in September 1937, then became a member of the Air Corps Board at Maxwell Field, Alabama, serving until November 1938. His next assignment was as assistant to the chief of the Plans Division in the Office of the Air Corps Washington, D.C. In September 1939 he became G-4, General Headquarters Air Force at Langley Field, Virginia, and transferred to Bolling Field, D.C., in June l94l. In September 1941 he was assigned to the 2nd Air Support Command. He became intelligence officer, A-2, of the Air Staff in Washington, D.C., in 1942, and in June of that same year was designated director, War Organization and Movement, Headquarters Army Air Forces, Washington, D.C. He served in this capacity until the following November when he became commandant, Air Forces School of Applied Tactics, Orlando, F1orida. On November 1, 1943, the Army Air Forces School of Applied Tactics was redesignated Army Air Forces Tactical Center. In March 1945 he was announced as commanding general of the Army Air Forces Eastern Flying Training Command with station at Maxwell Field, Alabama.